To ensure proper safety and avoid any unexpected delays, this post discusses the ins and outs of crante hand signals. As always, be sure to check your local laws or work with a reputable crane rental service as regulations constantly evolve. What Are Crane Hand Signals? Crane hand signals are the way the crane operator communicates with the person directing the load, the signaler. It's how the person on the rooftop, or on the ground, tells the operator which direction he wants the crane to go, especially if he cannot see the load he’s handling. Two-way radios can be used on many job sites, but the use of traditional hand signals is often preferred when the crane operator and signaler can see each other. With the chance of bad reception and dead batteries, the signals are better since there’s an established code and mutual understanding. Not to mention, a signaler is often required by law if the operator's view of the intended path of travel is obstructed. Who Can Give Crane Hand Signals? Governed by OSHA, a person must be qualified to give crane signals to the operator. While there should only be one designated signaler at a time, the crane operator must obey STOP signals no matter who gives it. A signaler should always be in clear view of the crane operator and have an unobstructed view of the load and equipment. There are 18 commonly utilized hand signals. However, understanding how to perform the signals is just the first part. A good signaler also knows the corresponding body language. For example, if you take your hand and point it up in the air and then put your fingers together, that's a signal for a cabling up. If someone is making the motion very quickly, but they want you to go slowly, there can be confusion. While many people learn the signals from years of experience, certification is necessary to be OSHA compliant. You can reach out to third-party companies, such as COCI (check), for the proper training. AME is dedicated to formally training all of our employees, including the crane operators, truck drivers and the teams that build the cranes. 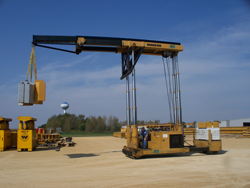 Certified crane hand signalers and crane operators are available for any crane rental service. Before our crane operators start a job, we will always host a pre-lift meeting to discuss the lift list and which person will be giving the hand signals if it’s not one of our own. While many of our projects are with repeat clients, if it’s a new company, the operator will ask the hand signaler questions to ensure he will receive the proper signals. Is Hiring an AME Qualified Hand Signaler Worth the Money? For the best results, we recommend hiring one of our certified hand signalers when you rent an AME industrial crane. Since we are assuming more liability, there is an additional fee, but it helps ensure that a project is done right the first time, every time. On a project where unexpected hiccups can throw an entire project off track, it’s important to prepare what’s within your control in the name of safety, the timeline and budget.